My student used the app 'Turboscan' to create a black line image on a perfectly white background. If you do not have that app and your image is not as clean looking as you want, you can just select 'color range' 'shadows' and then play around with the sliders until just the black sharpie lines are selected. You can then cut them and paste them into a new document and delete the old file. You can then flatten the image and you will have a perfect black line drawing on a white background. Unlock the background to turn it into an editable layer and you are ready to follow the rest of the tutorial. When you are done completing the above assignment, turn in your short video using Google Classroom. Your next assignment will be to create a motion sequence in Adobe Animate. In this case I used a dance sequence of a twirling ballerina to create this fairy. You may use a walk cycle or any other human movement cycle you find on the web. I have collected several useful motion sequences here and suggest you start by opening one of them and downloading it to your computer. For this next assignment you will need to use a drawing tablet and stylus. If you are new to my animation class and have never done animation please click here and here to get caught up. Once you are caught up, all the information you need to complete this assignment is included in this blog post. Create a ten second animation showing an original looping movement sequence and turn it in via Google Classroom when you are done. You must draw the images yourself. Attach a copy of every single reference picture you used and the link where you found it. You may use an image found on the Internet as inspiration as long as you cite your sources. However, you may not copy and paste the image into your PSD and claim it as your own. You must draw over the source file in another layer, transforming it into your own original character. You may not use unaltered copyright protected characters by other artists. Creating an original character that looks distinctly different from already existing copyrighted characters is a requirement of this assignment. Tracing should only be used to capture the movement sequence of the characters. After that it is your responsibility to transform your images into something uniquely yours. I created a multi-layered Photoshop file. 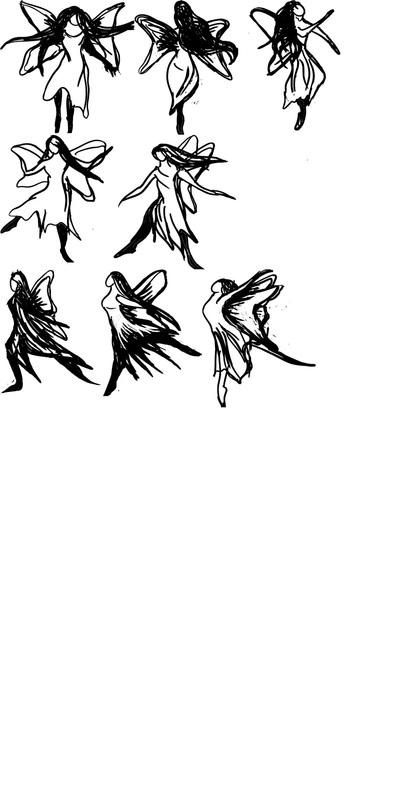 In each layer I drew a figure in my dance sequence. I used an image from this site to trace the movements of the figure, but I created my own character; a fairy with long flowing hair, a long dress and butterfly wings. I found the image by doing an image search for 'dance sequence'. In the video below I explain exactly how I was able to export my multi-layered PSD to Adobe Animate, convert each layer to a keyframe and then create an animated cartoon of a fairy dancing. Open a HTML5 canvas, 1100 pixels wide and 800 pixels high, twice the size of the default settings. File: Import to library. Import your entire layered Photoshop file with each layer visible. Open the folder on the library and you will see all the layers, stacked, as key frames, in order. Insert blank keyframe and then drag the top layer on to your stage. Each frame throughout your animation needs to be copied and pasted so that it appears twice in a row on your timeline. Click on the frame, on the timeline, and copy frame then paste it on the timeline. Then create another blank key frame next to it and drag the next image in the sequence onto the stage. In order to figure out how to position each frame, you will need to use the 'Onion Skin' feature. This will enable you to see the previous frame so you can align your images. Remember, you are going to copy and paste each frame before adding each new blank key frame and dragging over the next image in the sequence. You will be using a frame rate of 24 frames per second. Since each frame is repeated twice, this means you will need 12 distinct frames to create a single second of animation. In my animation I only created 8 drawings that I used over and over again. The fairy is twirling and the images repeat themselves, over and over again so I am able to simulate her movements by continually using the same images in sequential order. One of the most important shortcuts to learn as an animator is the use of repeating movement cycles, starting with the walk cycle. To learn more about the walk cycle and how to use it in animation, please click here. Once you have used every frame, click on the first frame on your timeline and then your last frame, while holding the shift key down. This selects all the frames. Copy all the frames and then paste them at the end of your timeline. Go back to where your last frame ended (before you pasted) and start dragging each frame to the correct position to continue your sequence, using the Onion Skin as a guide. Once you have 10 seconds of animation, add another layer and drag it under your first layer. I had saved a green square on my desktop and I imported it to my stage and enlarged it to fill the background. Remember, if you import media to the library you can use it in individual frames. If you import media to the stage it will appear in all the frames you have created up to that point. To test your video, go to 'control' on the top of the screen and select 'test' from the drop down menu. Now is the time to make any necessary corrections. Export video. Click convert video with Adobe Media Encoder. Click 'browse', name the video and save it to the desk top. Go to the Media Encoder (it will open in a new window) and click on the green triangle at the top right corner where it says 'Auto Encode Watch Folders'. Find and view your converted video on the desktop. If you followed the directions correctly it should be about 10 seconds long. Watch the video below and follow the sequence of screenshots to learn how to create a green screen animation using Final Cut. Drag the green screen animation onto the timeline and place it above the background photograph so that it appears to cover it completely. Click on the 'Keyer' in the effects menu and drag it over to your green screen animation. The green background will disappear, revealing the background image. Click on the top layer and then on transform and drag the corner of the top layer to reposition and resize your figure. Press 'done' when you are satisfied. Import your sound track and drag it onto the timeline, under the background layer. nice work and concept, it seems that every picture has some story inside, thanks to sharing with us your efforts are highly appreciated.